I met members of the Get Low production following the NBR screening of the film on July 19, 2010. Director Aaron Schneider, Robert Duvall, Bill Murray, producer Dean Zanuck, and Sissy Spacek gathered to talk about the film. It was a fairly serious discussion with Duvall especially being in somewhat ornery demeanor, still in beard and seemingly in the character of “Bush” Breazeale. Much of our talk centered around finding the right locations, the value of the vintage wardrobe, and capturing Duvall’s big speech at the end in a long duration shot. 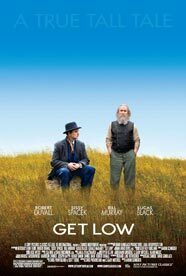 Get Low, the first feature film by cinematographer/director Aaron Schneider is a self-proclaimed “true tall tale.” It’s the quirky story of Felix “Bush” Breazeale, a recluse played with sly humor and a straight face by Robert Duvall, who comes out of the hills and into a small Tennessee town with a simple request. He wants to arrange a funeral party–and invite everyone who ever heard of him (and anyone else who’s interested) to come and tell a story. The kicker is he wants to do it now–while he is alive to enjoy it. Nobody has heard of such a thing and he is turned down flat by the local minister. Bush has a bad reputation–some say he’s a killer, he chases kids off his property with a shotgun, and he’s an ornery old loner. But the conversation in the church between Bush and the minister is overheard by Buddy (Lucas Black), a young funeral assistant with a wife and new baby who could use a financial break. His boss (Bill Murray plays Quinn with the deadpan humor he’s known for) is looking for business in a town where nobody seems to die. He does everything he can to get Bush’s “Hermit Money” but nothing with the old man is as simple as it seems. The film opens with a wide shot of a two story house on fire–it is the middle of the night and we strain to find detail in the flames. Suddenly a burning man bursts from a window on the second floor, runs across the roof and leaps to the ground. He circles the back of the house before running straight towards and past the camera. In the next shot an old window pane shatters, a boy hurries away, and an old man, clutching a shotgun, runs out of a small wooden house, chasing the terrified boy who threw the rock. The two events–the burning house and the angry hermit–are connected somehow and Get Low sets out to answer the mystery. Complicating the story is Mattie, played by Sissy Spacek, who has a mysterious past relationship with Bush that may be the reason he has come into town with his odd request. Get Low is a low budget film with fine acting, beautiful camera work (cinematographer David Boyd), great locations and set design (production designer Geoffrey Kirkland, The Right Stuff), realistic period wardrobe (Julie Weiss, Frida, 12 Monkeys), and the distinctive dobro music of composer Jerry Douglas. It was written by Chris Provenzano (Mad Men) and C. Gaby Mitchell (Blood Diamond), and inspired by a folklore tale overhead by Mr. Provenzano. Aaron Schneider, the director, received his big break when his short film Two Soldiers won the Academy Award in 2004. Based on a story by William Faulkner, Two Soldiers told the story of a young boy who goes to great lengths to follow his older brother into World War II. Both films have a nostalgic feeling for Southern small town main streets, simpler rural living, and the power of storytelling–it is easy to see how Schneider’s experience on Two Soldiers helped him to prepare for Get Low. Set in Tennessee during the 1930’s, Get Low is filled with funny and unexpected moments that erupt between the small group of characters who try to make sense of Bush’s request. Lucas is continuously taken aback by the strange actions of this suddenly emerged recluse. When he goes to the cabin to negotiate the funeral details he gets shot at by Bush. Quinn talks to Mattie, who has returned to town after a long absence, and he is shocked to discover that she has “a past” with the old man. They try to get an old friend of Bush’s (Bill Cobb) to join the funeral and deliver a sermon. But the preacher expects some sort of explanation or apology for a mysterious past event that Bush refuses to acknowledge. Bush sits to have his picture taken and his massive beard and long hair seem to take on a life of their own. Event by event the story moves towards a resolution that finally reveals itself when the day of the funeral arrives. Bush can finally tell the true reason he has created his funeral–and he may find some sort of redemption by doing so. Despite the tight script and outstanding performances there are a few awkward plot issues that cause the film to stumble a bit. For instance, we are meant to believe that Quinn might run off with money raised for the funeral but the action isn’t developed in a suspenseful way. But Get Low is a gem of a movie that is satisfying and fun. It features some of the best actors of our generation bringing their roles to life through the sheer pleasure of exploring their craft. Like the folklore and tall tales that inspire it, this handcrafted film is endearingly imperfect, full of warmth and discovery, and bursting with heart and humanity. This entry was posted in Film Reviews and tagged Aaron Schneider, Bill Murray, Get Low, Robert Duvall, Sissy Spacek by Thomas W. Campbell. Bookmark the permalink.